I always find butterflies an image of hope. not sure why, but they comfort me. This butterfly was a victim of my neighborly yard stalking one afternoon. By that I mean I saw this butterfly flutter by me headed for the neighbors yard. Well, of course so did I! Off to the neighbors. For all those folks who have seen my photos and listened to me blather on, you all know I hang out in the neighbors nicely manicured and landscaped yard all apparently all hours of the day and night. There's so much more of interest going on over there and only boring lawn work going on at my place. Anyway, back to the pretty monarch butterfly. It landed long enough for me to pop a few photos then had enough of my camera shenanigans. Are you wondering how I came to have my camera with me at this very opportune time? I usually have my camera around my neck in the yard. Unless I am doing yard work - then the camera is close. One never knows when I need to zip into the neighbors yard really quick and hightail it outta there even quicker! I made the flowers, that I am calling Hearts A Glow, which I popped on my very first video tutorial. ohhhh I also used a Dusty Attic corner piece. Here is a link to my Hearts A Glow Flowers tutorial. Thanks a bunch for looking. I appreciate this a great deal. 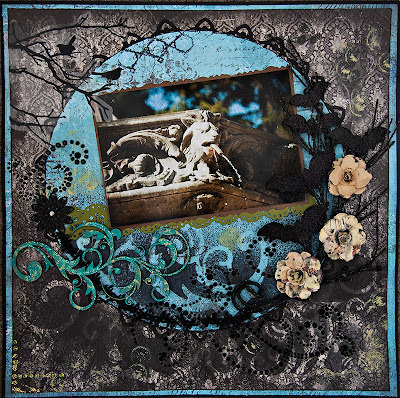 Serenity - created with the Scraps of Darkness kits. I actually combined the Kaisercraft Chantuse Diecut from the August kit with the Authentique Glowing paper. 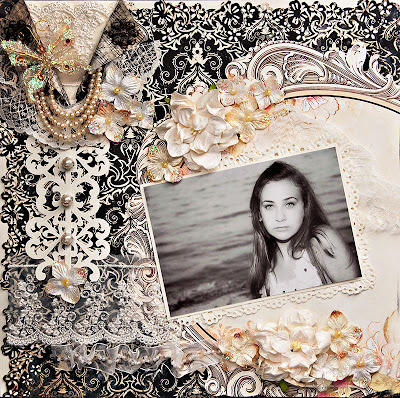 This was created for a Stalker Challenge where the requirements were to use a black and white photo with only black and white or black and cream papers. I took this photo of a friend's daughter in September. I love the photo - she is just a stunning young lady. Then she happily gave me permission to post the photo. 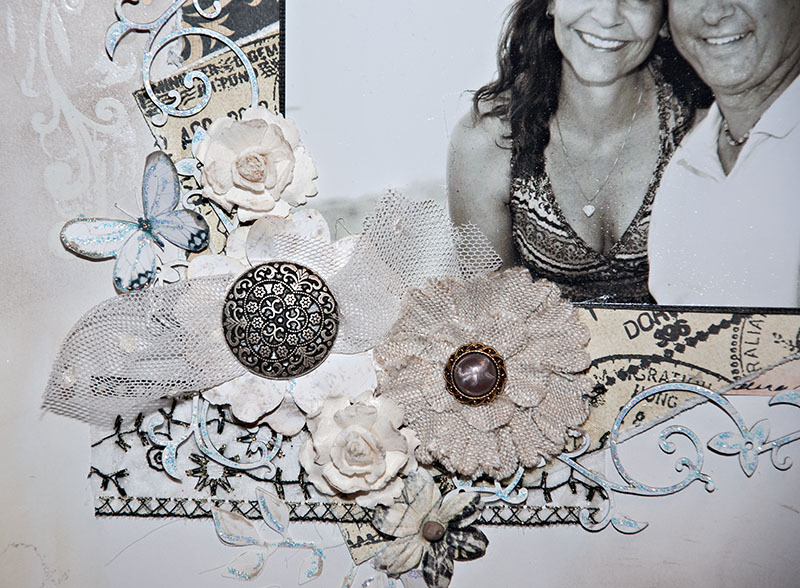 I used the Martha Stewart Scroll Heart punch to make my embellishment. 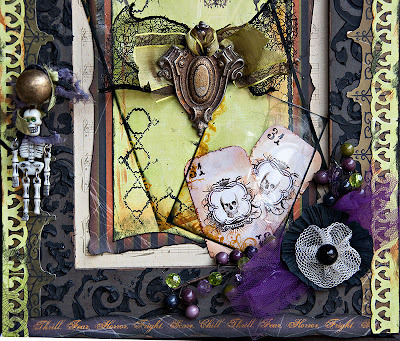 Enchanting Creations Magazine Published My Layout in their November 2011 Issue. What a great magazine and so easy to read online. I have found that not all e-magazines are easy and user friendly. This one, however has the ease of reading a real magazine with no worries of spilling coffee on it. 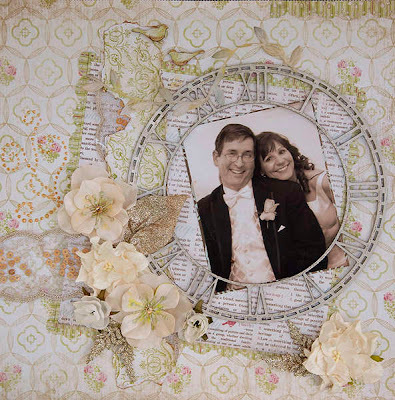 This is a layout with my husband and me on our Wedding Day 2008. This LO has a few things I love...first my husband and second Dusty Attic. I love those Dusty Attic clock faces. OK I am a bit of a fanatic, I'll admit, but it is fun stuff. Thanks again for this honor. And thanks to YOU for looking. Phantom Skeletons in My Closet - Created using Scraps Of Darkness Oct kit, All Hallows Eve. I made this specifically for a contest at Pink Paislee, using the Phantom paper line. I just had a ball letting my mind travel on this one. This is the door view. 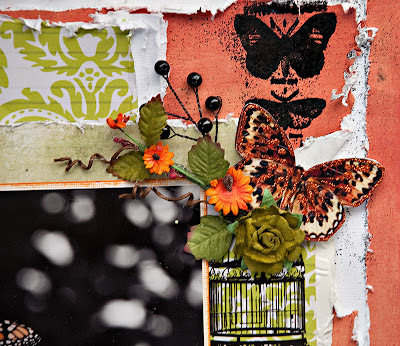 To create the door , I used some molding paste mixed with black paint for texture. Then some punching and Pink Paislee products. The door knocker was a piece I have had for about 10 years. Bought at an antique shop and was going to use on a project that never cane to fruition. Know what I am talking about? We all have projects like that....started in our minds ONLY! This is the inside door view. 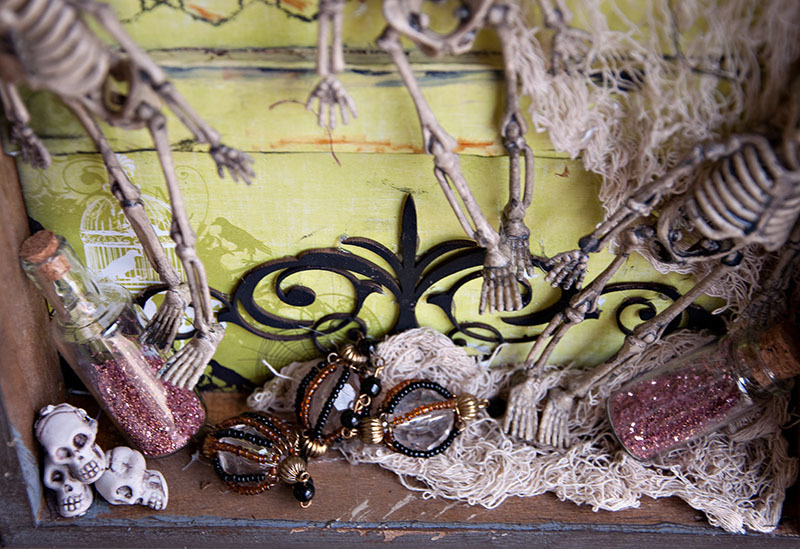 Some Dusty Attic Skeleton keys hanging from a Pink Paislee flower. I colored the Pink Paislee "haunting" cards with nibs and Timmy inks. Dressed the place up with some black creepy cheese cloth from the Halloween decoration isles found at any store ( discounted of course!). The Phantom tag is packaging from the Pink Paislee card pack. 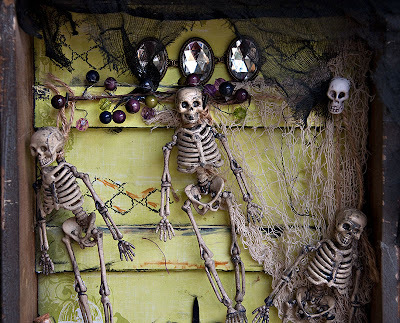 This is the inside view where my skeletons live. Not gonna tell you what they are, but they are doosies! I used a Dusty Attic scroll. 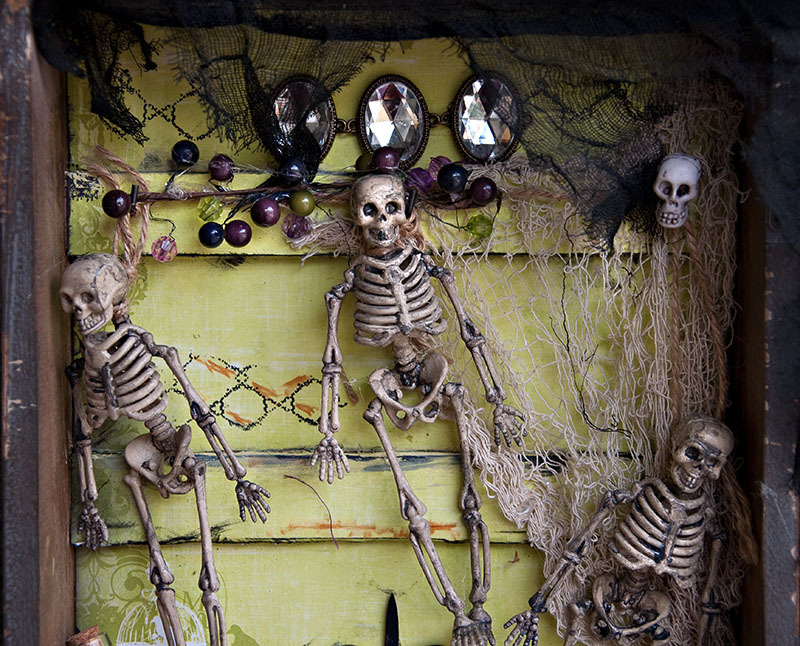 and some skeletons found in the decorations isle at any store. These happen to come from Michaels - yes of course 60% off! And the rest below are just more close ups. Enjoy and thanks for looking. Announcing the BLOG Hop winners! My winner is: CAROL from Carolee's Scrapping SPOT who said:Beautiful layouts! Love them all thank you for sharing! Pleased contact me for your prize. Thanks to all who played. 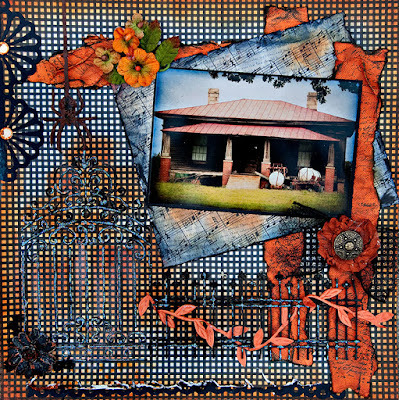 I appreciate this a great deal and this was my first blog hop si I am very appreciative. 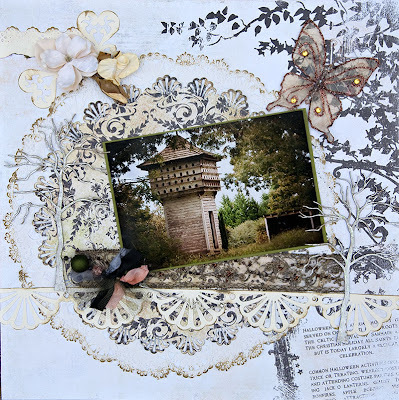 OMG I had so much fun on this blog hop!!!! I absolutely love the October kit!!! Instant love with this kit! Soooo nice! 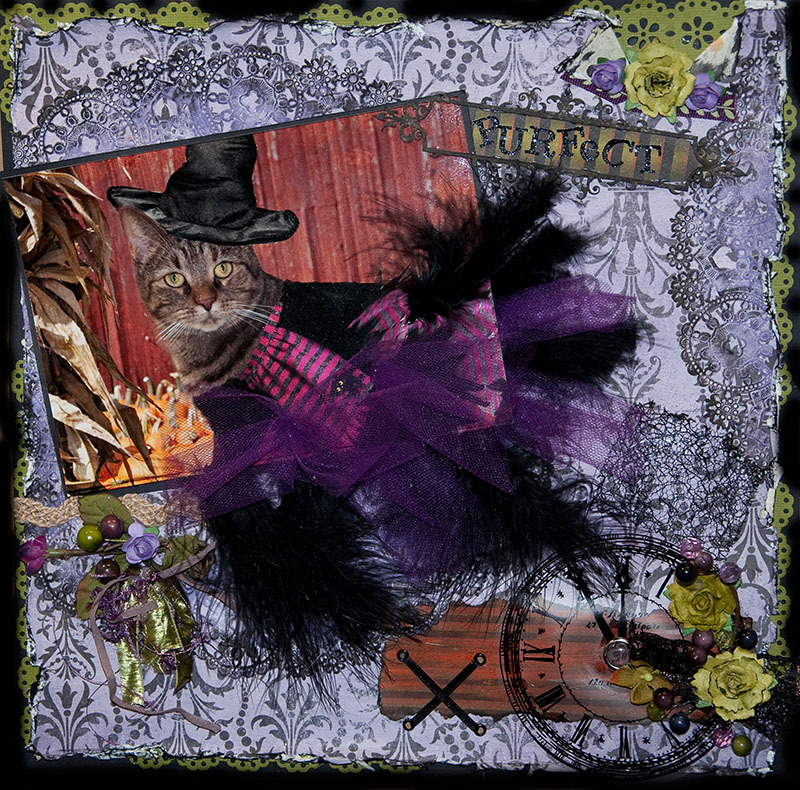 The Scraps Of Darkness Halloween Blog Hop starts today and runs for 2 days through midnight Oct 16th. Prizes prizes prizes everywhere. 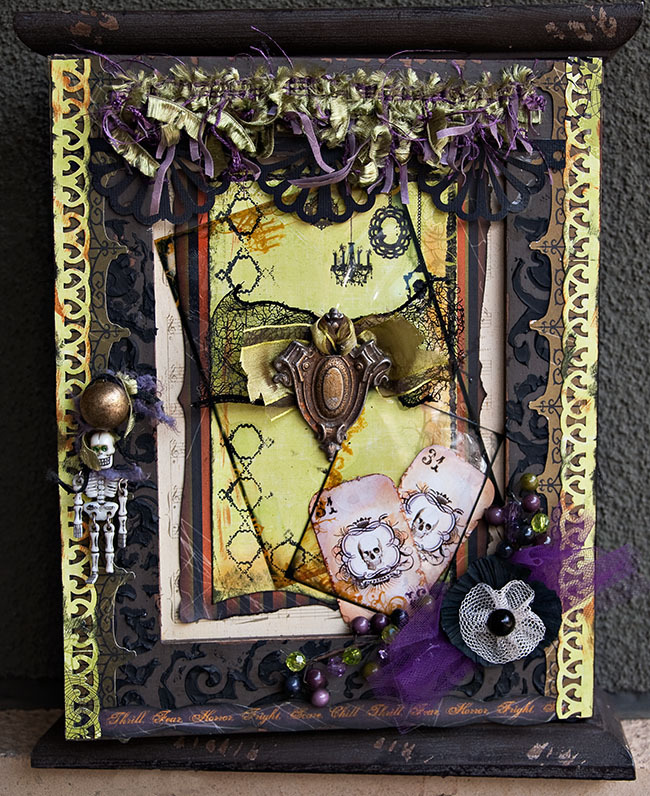 The Scraps of Darkness blog will be giving away two main KITS and each designer will be giving out prizes on their individual blogs. The chances of winning are huge and you can even win more than one prize!!! 1. Start at the Scraps of Darkness Blog, join as a follower and leave a comment. 2. Hop to each of the design team blogs. Join each blog and leave a comment. 4. Check back on Oct 17th when winners will be announced. 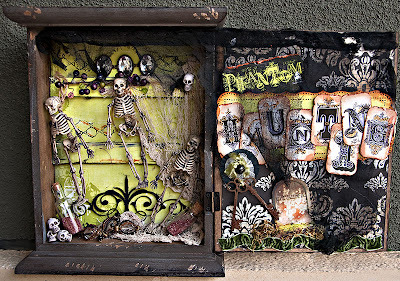 So be sure to stop at the Scraps of Darkness Blog first to begin this awesome Trick or TREAT adventure!!!! If you landed here from Celina's blog, then welcome. Remember to join my blog and leave a comment and then hop over to Lisa's blog here. It's also reveal day at SOD and always an exciting day. 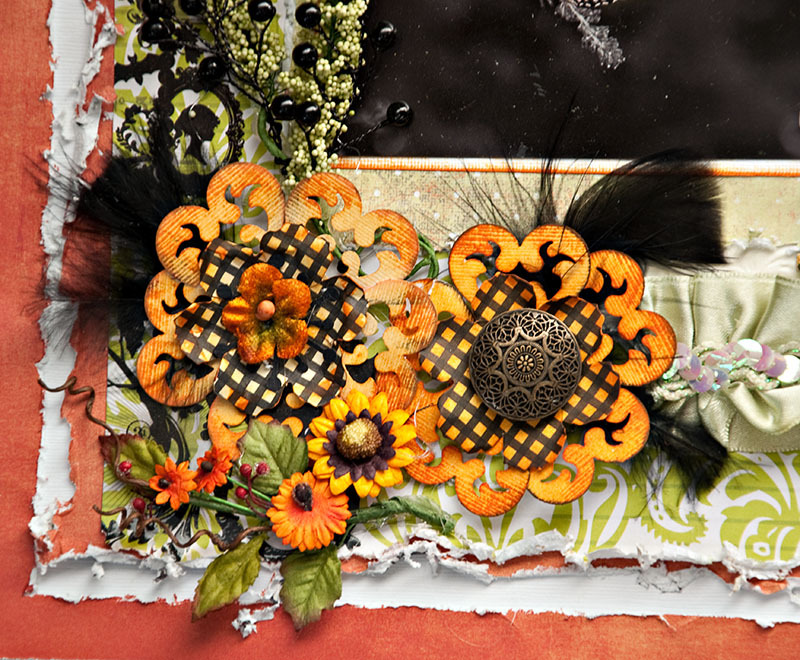 These are the layouts I created for the amazing All Hallows Eve Oct kit. 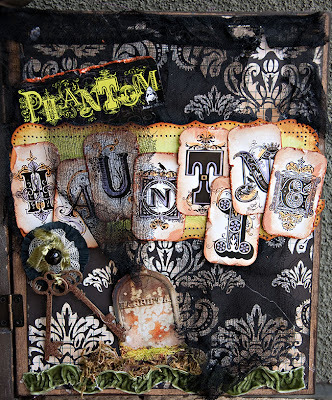 Thanks for looking and happy hauntings. Stop by for several chances at some Trick O Treat prizes and fun. Just wanted to give a quick heads up for some exciting news....Scraps of Darkness will be hosting "The Halloween Blog Hop" on our next reveal day, which will be held on October 15th in celebration of our favorite Holiday and most exciting kit. You want to make sure you don't miss this awesome event. SOD will be giving away 2 main kits and each DT member will also be having a little giveaway. You have many chances to win. 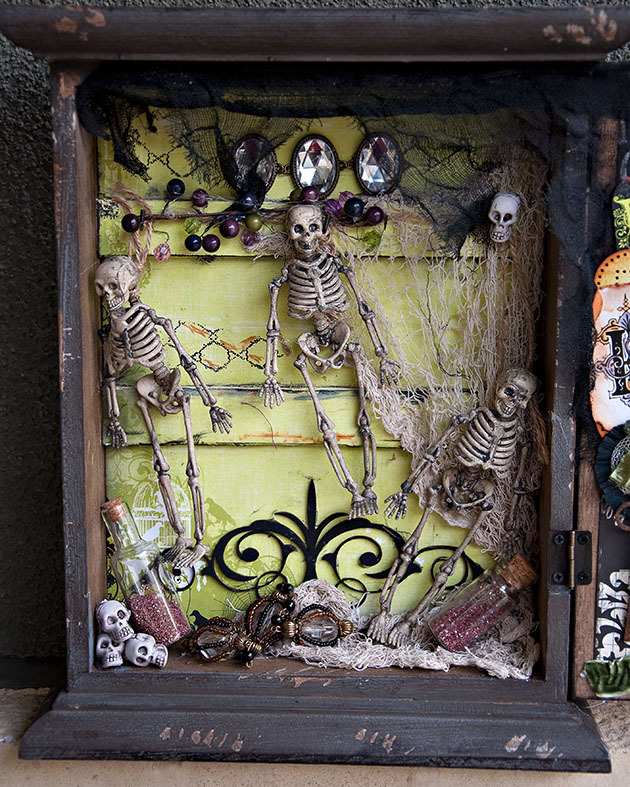 So be sure to stop at the Scraps of Darkness Blog first to begin this awesome Trick or TREAT adventure!!!! 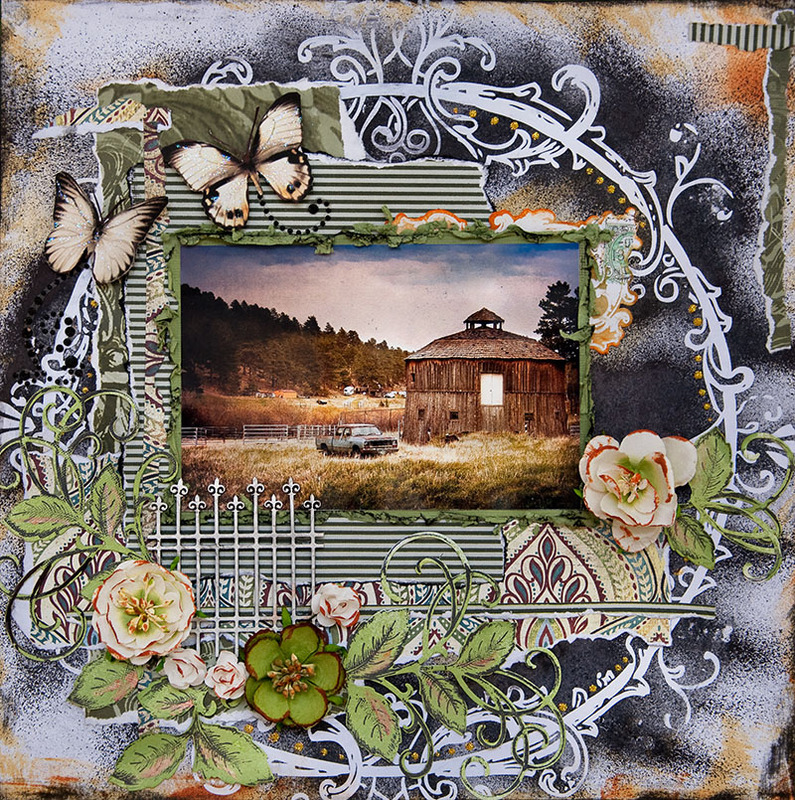 I am featured At Robins Nest! How cool is that! Escape Kitty - What's in a Nickname? 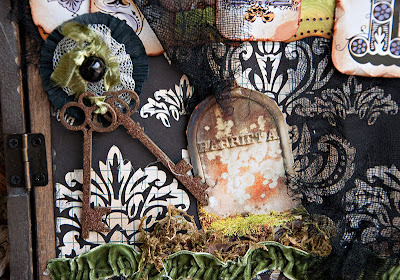 Scraps of Darkness design team is being featured at the Chattering Robin's blogspot, which features Robin's Nest papers 2011 Whilshire Collection. This week is my turn to be featured. This paper is absolutely striking and very regal looking and was so easy to use on layouts. Please check them out and check out the rest of the DT work at Scraps Of Darkness. Thanks to Lisa Novogrodski for her hard work in organizing this! She is one in a million. These are difficult times. In the quiet moments, let us be thankful for the tiniest of blessings. 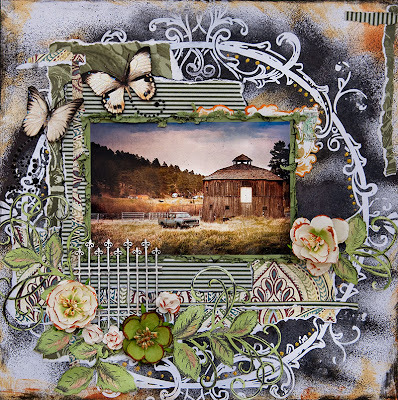 This was created using an image from izabelle Vintage images from Creative Souls. 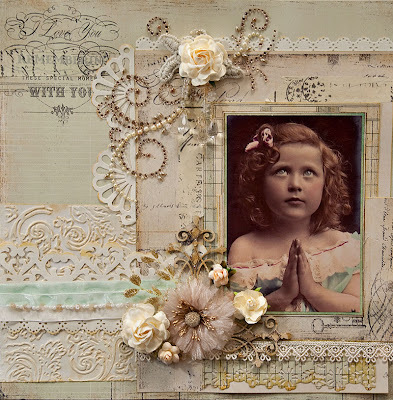 I used the Dusty Attic French Flourish Borders here. oooooo la la. The papers are Prima Printery - gorgeous papers for sure. 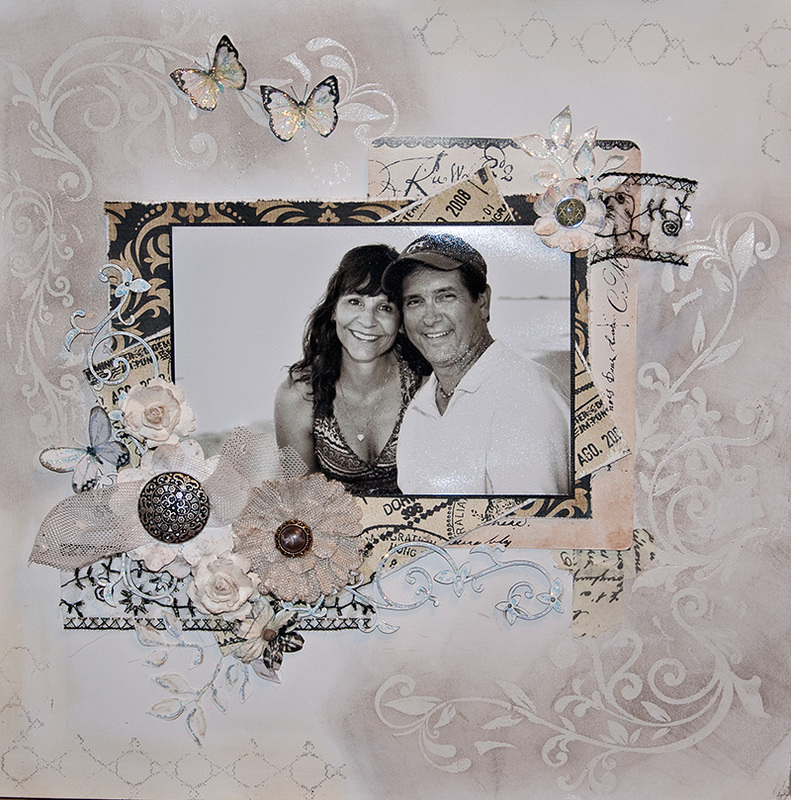 The background paper was made using the Tim Holtz Damask embossing folder. I rubbed the top of the embossing with Tim Holtz embossing ink and then covered with clear embossing powder. 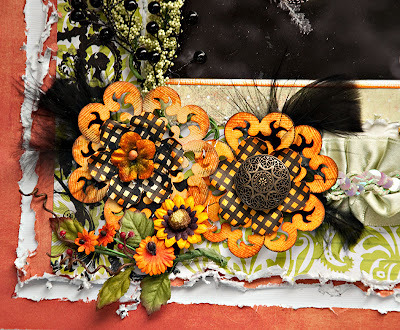 After it was heated to melt, I rubbed gently with Tim Holtz Scattered Straw. Thanks for looking and have a blessed day. I am thankful for you. 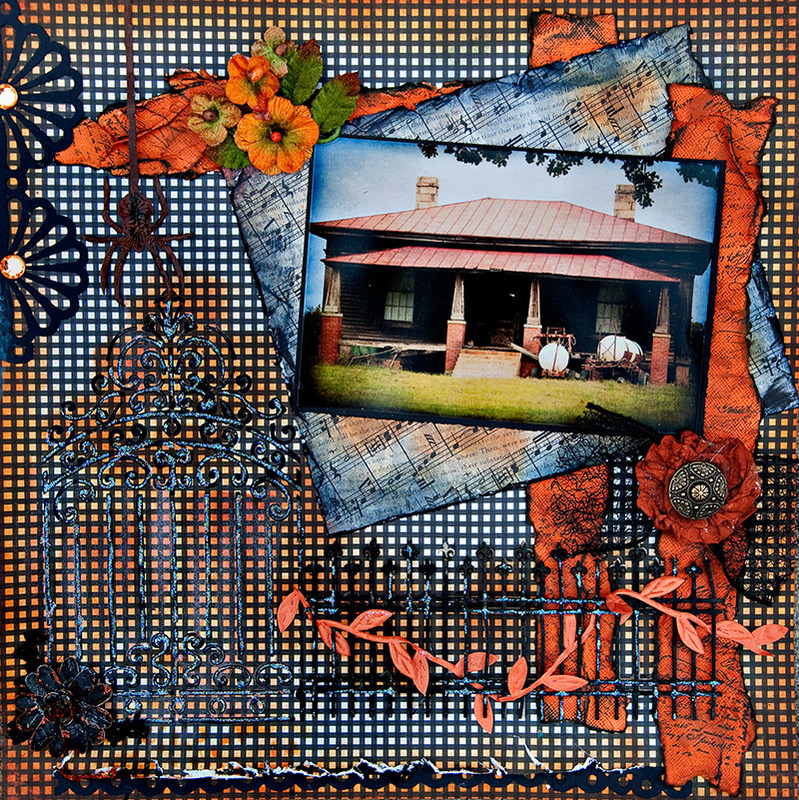 Scrap-cation - A Scrappers Vacation at Maggi's house. 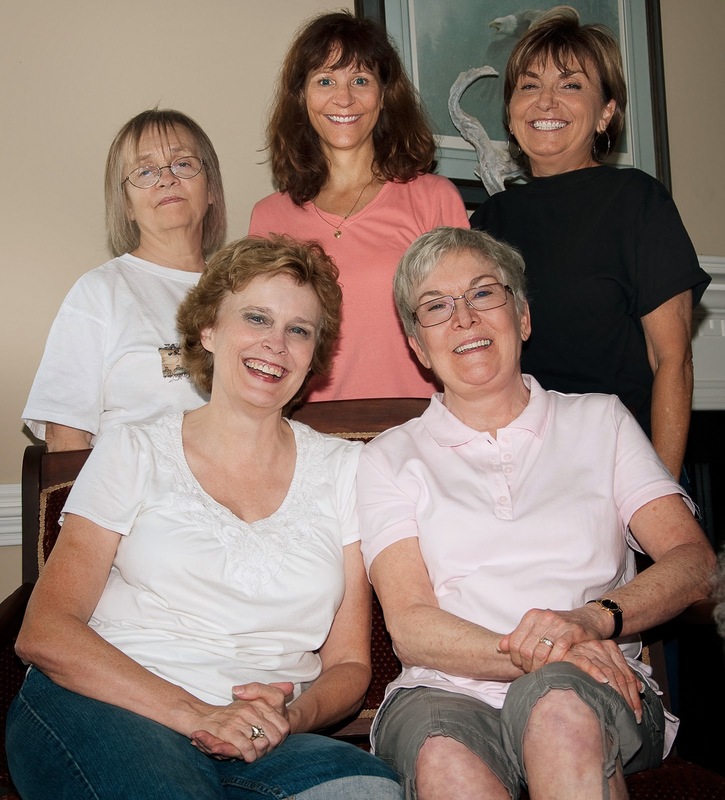 I took a scrappers vacation at the end of Sept 2011 to Maggi's house to meet up with some ladies and watch some first class talent being created in front of my eyes. There is NOTHIN better than seeing these art pieces in real life. I am not gonna reveal who is featured in the photo for privacy reasons, unless the ladies want me to blab. I am in the coral tee in the top row. We begged Maggi to see her scrap artwork. She pulled it out for us and she was left with a mess of drool to clean up. Honestly, I think we all realize that internet photos and even close ups just don't do any of the scrap art justice. I watched Maggi and the other artists create work that just gets lost on the internet. This photo was snagged from Maggi - thanks Maggi! See her blog for details. Now I want to take a few moments to just brag about Maggi and her husband and dogs. Her Southern Hospitality knows no limits. They are the kindest, sweetest people with the most loving dogs I have ever met. Maggi is a world class cook and dazzled us with some international cuisine two evenings, and a real Southern meal. Gotta admit - before I left my comfy house and simple boring eating habits, I was a bit frightened at Maggi's suggestion of her cooking a southern style meal for us. My initial thought -egads! I am NOT a foodie - meaning I do not delight in experimenting with eating. I have a limited range of foods I eat and am as fussy an eater as I am a scrapper. Maggi blew me away at every meal with exquisite cuisine. I am proud to say that I have now expanded my recipe file by a few more exactly doubling my recipe file size! Shows you how much I cook. A bit about her delightful husband. He is about as nice a person as you are ever going to find. A real gentleman, amazing adoring husband and perfect host. I can say he is an adoring husband because the two of us chatted a great deal. He had the sweetest words to say about his wife and he would get a look of contentment and happiness in his eyes that only a man in love can get. This is a photo I took on our recent vacation to Florida, August 2011. Boy do we just love Florida. We take our annual vacation there and let the stress and worries melt away in the hot summer sun, then wash away in the waves of the ocean. I pack my tripod and my remote control shutter release. This way I am not at the mercy of asking strangers to snap our photos, sadly ending up with pictures of our feet or miles of blue sky and the tops of our heads. Boy do I hate that. Can they not tell that they are looking at my feet? There is a WARNING I must tell you about in stashing a tripod in your suitcase. They are massively heavy buggers. They take up the valuable space usually reserved for shoes. Gotta pick your poison. Mine is forgoing the shoes for the photos. I carry the tripod to the beach, my husband sits and reads a book and I play with my camera. I am so easily amused. I may hunt for shells, or knock a few sand fleas off me, but I am happy and content. If anyone knows a great way to stop the sand fleas from biting, please contact me. I beg you! I wanted to create my own resist paper and keep things soft and romantic. 1. Started with a white piece of cardstock. 2. 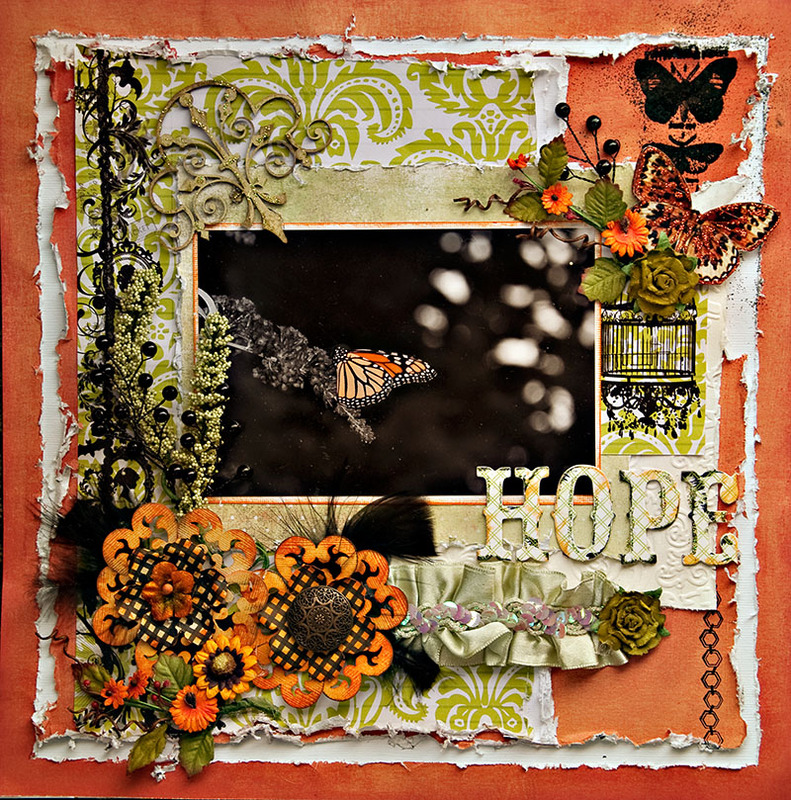 Picked a cool flourish stamp - Inkadinkaclings by EK Success - Flower Flourishes. I envied my friend Maggi's so I had to get one too. Thanks Maggi43 of Scrap Travel Bark. 3. Applied Tim Holtz embossing ink heavily on the stamps and then topped the stamp with clear embossing powder. 4. Some blasts with my Ranger Heat-It gun..... I am having a love affair with my heat gun. There is NO windstorm of product when you use this heat gun. Nothing moves on the paper. You are not left wiping embossing powders off every surface within 3 feet. What I am trying to say is you REALLY need this heat gun if you do not own it. .........little product commercial from Jen-Abler. 5. 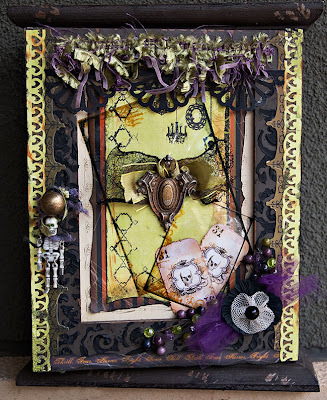 I used Tim Holtz Pumice Stone and my Ranger blending tool over the embossed areas that I stamped. BAM - done. 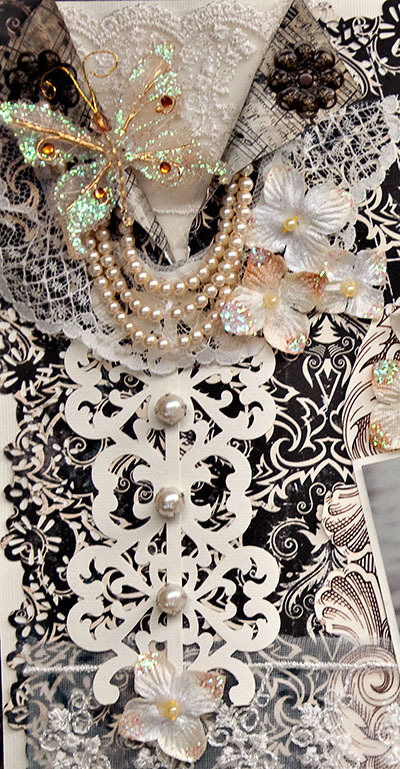 Now I move on to layers, florals and what not. The papers from the Sept. Scraps Of Darkness kit were absolutely perfect for the photo. I used the Teresa Collins World Traveler line and also a piece of the packaging from a Prima flower package. It matched so darn well. I absolutely loved this month's kit. It was versatile, gorgeous and packed to the brim with great embellies. I finished my floral cluster by adding my favorite scrappy products, my beloved Dusty Attic. Ohhhhhh you've got to know I love Dusty Attic - my postman certainly knows it. So does my banker and my credit card company. I think my husband knows too, but frankly all my scrappy stuff gets heaped together in his mind AND that's a real good thing. But back to Dusty Attic.... 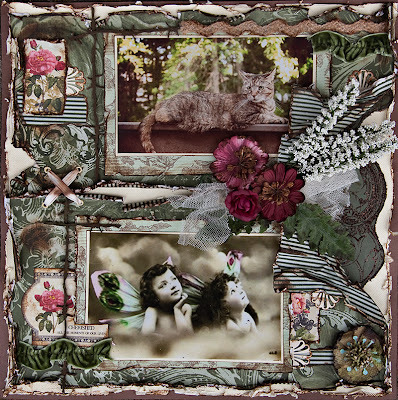 I used the Sweet Pea Border. I just panted it white and bent it to form a right angle. Covered it with some Stickles in icicle. 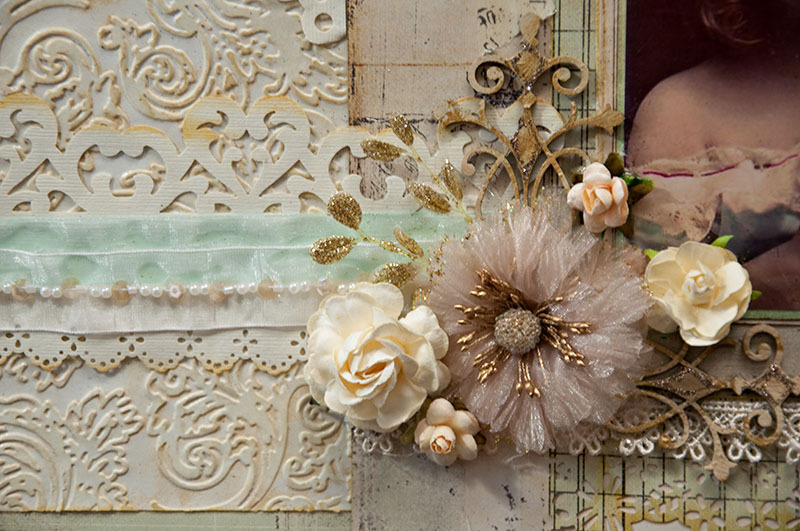 I provided you with a link to the Dusty Attic Sweet Pea border because YOU just may need this product also. hahahahahaha I just ordered two more pieces of it. Jen-Abler even enables herself. That big button holding the netting was a close out from Joanns. Can you say 50cents???? Well I can! 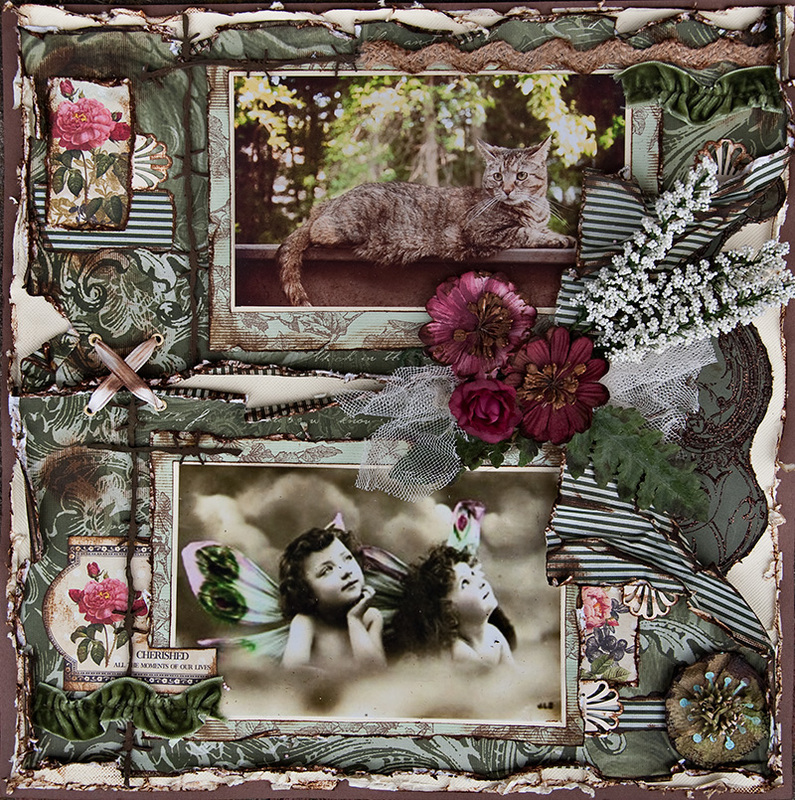 Done - a layout of my darling and me in our favorite place in all the world.